Posted on Sunday, September 28th, 2014 at 12:19 am. 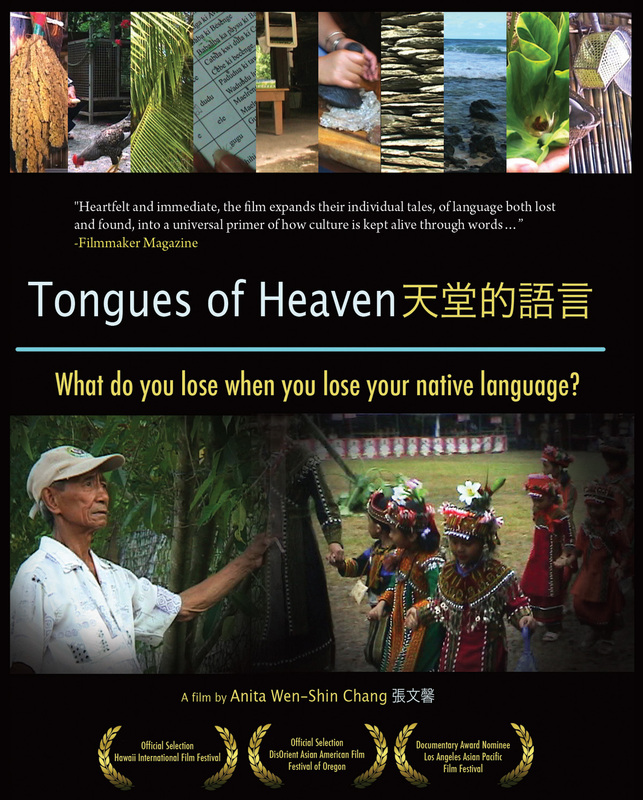 Taiwanese American filmmaker Anita Chang’s most recent documentary film, Tongues of Heaven, revolves around the issue of language loss and asks the essential question: “what do you lose when you lose your native language?” Her film explores the challenges of young indigenous peoples of Taiwan and Hawaii in learning the heritage languages of their ancestors — languages that are endangered or facing extinction. TaiwaneseAmerican.org is proud to be a Co-presenter of this limited theatrical engagement of Tongues of Heaven around the San Francisco / Bay Area in October. Other co-presenters include CAAM and NATWA. There will be Q&As and DVDs for purchase. Anita was born to parents who immigrated to America from martial law era Taiwan of the 1960’s. She grew up in Ohio and Massachusetts, and her first language was Taiwanese or Minnanese, which she gradually lost the ability to speak after learning English. Anita has produced fine works relevant to the Taiwanese community, most notably 62 Years and 6,500 Miles Between (2005) and Joyful Life (2007). Tongues of Heaven adds an additional dimension and commentary to her exploration of Taiwanese culture, language, and identity. How can one see this movie if one missed it’s showings in Bay Area? Is it available on Amazon or Netflix or elsewhere? Thanks for your interest Aly! The next public screening (free) is at De Anza College in Cupertino, 11/20, 10:20am-12:30pm, Hinson Campus Center, Room B. If you send me your email at [email protected] you can stay updated on screenings, or follow http://www.facebook.com/TonguesOfHeaven. I know that zhang is same as Chang. So, is reply above from zhangwenshin from Anita? Thank you so much! Such an important topic. Language is so intimately related to culture, heritage, and identity, so that losing language of ancestors seems to be losing a lot more. Do you have any other upcoming bay area screenings scheduled yet, besides Cupertino? ( Cupertino is far from me.) Is the entire film shown at the screenings? Thank you so much for making this film. I am looking very much forward to seeing it!